La couleur n’était pas encore inventée quand tu es née? Le magazine de l’UNIL « Allez savoir » No 42 de septembre nous rappelle cette « autre révolution 1968 », que nos voisins français ont vécu une année plus tôt. Il en va de même pour la langue de Goethe: les Allemands diffusent en couleur dès 1967 et les Suisses allemands en 1968. Ils seront suivis par les Autrichiens en 1969. Au sud, la Suisse italienne précède largement l’Italie. C’est sous le titre de « Blog et littérature: l’art de la conversation à l’heure d’internet » que la Société d’Etudes françaises de Bâle va accueillir Pierre Assouline demain, 22 septembre (merci à Peter Haber pour l’indication). 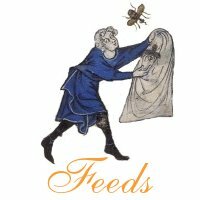 Son blog, « La république des livres », qui est lié aux pages du Monde, a vu le jour en 2004 sur une idée de Jean-François Fogel (co-auteur d‘ « Une presse sans Gutenberg ») et a été qualifié en 2006 (par Le Monde) comme faisant partie des « 15 blogueurs leaders d’opinion sur la toile ». Pour ceux qui n’auront pas l’occasion de participer notons l’enregistrement d’une conférence qui a eu lieu en mars dernier au Centre national du livre. Ce site présente l’orateur. Enfin, signalons sur le dit blog l’entrée concernant Wikipedia, « L’affaire Wikipedia », susceptible d’intéresser l’historienne et l’historien. 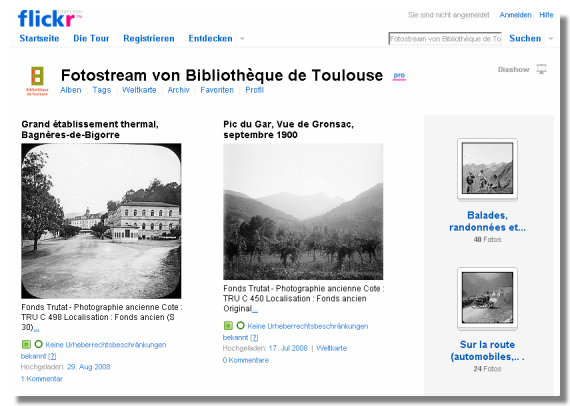 The photosharing website Flickr has expanded its „Commons“ project. I wrote about the first iteration several months ago describing the decision by the American Library of Congress to allow the public to start marking up images from their collection. Since that time, Flickr (owned by Yahoo!) has expanded the number of its partners to include the Smithsonian Institution, the Brooklyn Museum, the George Eastman House, the Biblioteca de Arte-Fundação Calouste Gulbenkian, the Bibliothèque de Toulouse, the National Media Museum, and the Powerhouse Museum. These additions to the project have increased the number of images available through the commons exponentially and, because the images being deposited in the Commons are being chosen with some care, this collection is rapidly becoming one of the most interesting, if idiosyncratic collections of photographs available to the general public. I’m pleased to announce that after more than two years of steady work our project team at the Center for History and New Media has launched Making the History of 1989: The Fall of Communism in Eastern Europe. 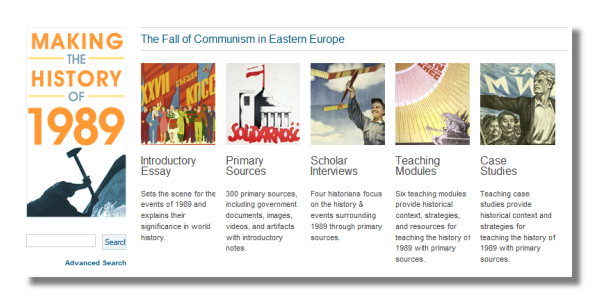 This project offers users hundreds of primary sources on the events of 1989 and the end of the Cold War in Europe, interviews with prominent scholars, and a suite of resources for teachers and students, including extended teaching modules and a series of teaching case studies focused on particular primary sources. Because this project was built from the ground up using our Omeka platform, we have been able to add some new features unavailable in some of our earlier world history projects. These include the ability to geolocate the primary sources in the database (a feature being recoded as I write this and so not available today), and the ability to register as a user, login, and then self-organize the primary source archive. Users who are logged in can save individual sources, add their own tags to those sources, and write note on their sources for later reference. Users can also create an online poster from their personal set of sources–a feature targeted specifically at students. As with the launch of any major web project, there are still a few things to be added. We still have a few teaching modules to add, some of the primary sources still need annotations, and one of the scholar interviews is still in production. But the majority of the resources are now up and available for your use. No project like this one would be possible without a large team of people–staff and authors–who have worked very hard over the past two years to bring this effort to a successful conclusion. A quick look at the About page will give you a sense for how many people it takes to make something like this happen. Since this is our official launch week, I want to publicly thank everyone who has contributed to the project. And, of course, I would be remiss if I did not also thank our two principal funders–the National Endowment for the Humanities and the German Historical Institute (Washington, D.C.). The Center for History and New Media (CHNM) at George Mason University invites expressions of interest to join the Center in applying to the American National Endowment for the Humanities for one of NEH’s Fellowships at Digital Humanities Centers. NEH Fellowships at Digital Humanities Centers (FDHC) support collaboration between digital centers and individual scholars. An award provides funding for both a stipend for the fellow while in residence at the center and a portion of the center’s costs for hosting a fellow. Awards are for periods of six to twelve months. The intellectual cooperation between the visiting scholar and the center may take many different forms and may involve humanities scholars of any level of digital expertise. Fellows may work exclusively on their own projects in consultation with center staff, collaborate on projects with other scholars affiliated with the center, function as “apprentices” on existing digital center projects, or any combination of these. The results of the collaboration may range from “proof of concept” to finished product. CHNM plans to select a scholar for its application by July 31, 2008. Interested scholars should send a CV and a 2-3 pp. description of 1) their general interest in the fellowship and the Center; 2) what specifically they would like to work on during the term of the fellowship; 3) any experience they might have that is applicable to this work; and 4) how this work dovetails with any current Center projects (e.g. the National History Education Clearinghouse, Zotero, Omeka, the Bracero History Archive, etc.) Send these two documents to chnm@gmu.edu with the subject line “NEH Fellowship” as soon as possible. Applications will be reviewed as they come in, through July 31. The selected scholar will be notified soon thereafter, and CHNM will work with that scholar to submit a grant application to NEH by September 15, 2008. The Department of History and Art History at George Mason University (where CHNM is located) has just received approval to hire a tenure track digital historian. We are very excited about this new position, which will be half in the Department teaching digital history courses and half in CHNM working on existing projects and developing new ones for us. If you know anyone who would be interested in applying or who should be interested in applying, please pass the word to them. If you are interested in applying, you need to go to the GMU online application page and the number for this position is F5343z. Specific questions about the search should be directed to me, since I am the chair of the search committee. A formal advertisement will appear in the usual outlets soon. The link to the formal posting of the position is now available. The largest penal system in human history–the Gulag–is fast disappearing from the physical landscape. Of all of the many camps that dotted the maps of the Soviet Union, only Perm 36 survives largely as it was before 1991. The rest of the Gulag complex has been torn down, scavenged for scrap metal and building materials, or left to decay in isolated regions of Siberia now accessible only by helicopter. The Center for History and New Media at George Mason University, the Gulag Museum at Perm 36, and the International Memorial Society have collaborated on a new new website: Gulag: Many Days, Many Lives. This project explores the history of the Soviet Gulag through bilingual exhibits (English and Russian), an archive of primary sources, a series of podcasts, and other resources. Exhibits are presented with a thematic approach that illustrates the diversity of the Gulag experience through original mini-documentaries, images, and the words of individual prisoners. A searchable archive includes archival documents, photographs, paintings, drawings, and oral histories that give visitors the opportunity to explore the subject in much greater depth. Later this summer, Many Days, Many Lives will also feature a virtual visit to the Gulag Museum at Perm 36. Some time ago we at Historia i Media have described two new polish historical internet projects: A Commonwealth of Diverse Cultures and the online version of Museum of the Warsaw Uprising. These two initiatives can have a very strong impact for the nextcomming big historical presentations in polish internet by showing how to use new multimedia technologies in the case of history. Interfaces of both described here projects are developed on the Macromedia Flash technology. It gives a wide range of possibilities in showing interactive animations, sound, video etc. But it has also some big faults – for our interests most important one would be a case of usability in the context of the educational reasons. For the Commonwealth of Diverse Cultures, this problem has a smaller importance. This project tend to be more some kind of historical internet showcase than an educational resource, how it is in the second case with online version of the Museum of Warsaw Uprising. Virtual museum offers lot of digitalized documents, photos and exhibits. They can be used during historical lessons. But how? Because of the flash technology, nobody can add a link to the concrete subpage with one resource. Making the homework, pupil can’t put any unique reference to the material – so how it can be used in a text? It is important to everytime ask a question if the historical resources published online should be more attractive or more effective. Example of the United States Holocaust Memorial Museum shows the different way of presenting big internet collections, where there are no problems with references to the concrete materials and subpages. Usability and accessibility has more importance that the attractiveness of interface.